Situated directly on the Red Sea, the resort offers guests a private beach with all the recreation the sea has to offer. Guests at this resort can enjoy views of the Red Sea from our 336 rooms, suites and apartments. Guests can enjoy diving, snorkeling, parasailing among other activities. The resort’s event space makes an ideal venue for conferences and weddings. – Situated directly on the Red Sea, this resort hotel in Aqaba offers guests a private beach getaway with all the recreation the sea has to offer. – Only 20 kilometers from King Hussein International Airport, Tala Bay Resort provides shuttle service for flights through Royal Jordanian Airlines. 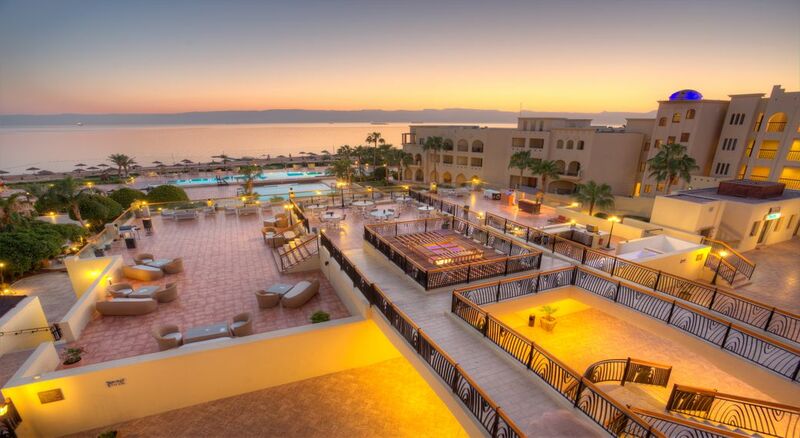 – Guests at this Aqaba hotel can enjoy views of the Red Sea from our 336 rooms, suites and apartments. – Free high-speed, wireless Internet. – The Resort offers, upon request, nonsmoking rooms and rooms designed for disability access. – Individual climate control and access to the Super Breakfast Buffet at Aziab, one of the resort’s on-site dining venues. – The bars and restaurants serve an array of local and international dishes. Guests can enjoy delicious meals, snacks and drinks both indoors and out, including at the beach and poolside. – A host of aquatic adventures are available near the hotel. Aqaba guests can enjoy diving, snorkeling, parasailing and yacht cruises among many other activities. The resort’s beautiful event space makes an ideal venue for conferences and weddings. The resort offers a variety of indoor and outdoor dining venues. Guests can dine poolside or at the beach or enjoy an indoor venue to take a break from the sun. The range of venues in these Aqaba restaurants is matched by their range of cuisine — Italian, American, Asian and regional dishes. From burgers to tandoori, salad to shawarma, you’ll find something tasty to fit your mood. Home to the hotel’s Super Breakfast Buffet, Aziab offers freshly squeezed juices, fruit, fresh pastries, continental favorites and a live omelet station. Lunch is served à la carte with an international range of options, including dishes from Italian and American cuisine as well as Jordanian favorites. Like breakfast, dinner is buffet style. You can enjoy your meal or cocktail in the open dining room or on the terrace, which overlooks the pools. The perfect place to enjoy a twilight cocktail, the Sunset Deck matches its expansive sea view with an impressive menu of drinks and flavored tobaccos. Guests can also enjoy appetizers, desserts or a light meal. Heat up your tastes buds with a spicy Indian or Thai dish at Heat Wave. This Asian restaurant features a hip atmosphere with vibrant lounge décor and panoramic views. A beachside snack bar, Bay Watch offers a variety of drinks — chilled, hot, alcoholic, juice — and tasty snacks like nachos and pizza as well as sandwiches and salads. Lounge in the sun with a chilled fruit juice, or kick back in the shade with a cold beer. A cozy venue in the resort’s lobby, Kenzi Lounge offers snacks and light fare and an array of coffee, tea and fine liquors. The lounge is a relaxing place to grab a light meal or share a cocktail with friends. At the Oasis Beach Bar, guests can enjoy a refreshing drink without leaving the beach. It’s a perfect place to enjoy the coastal view with the brew of your choice. At the Dugout Bar, guests can enjoy a drink without ever leaving the pool. This bar, adjacent to the hotel’s main pool, offers poolside ordering. In addition to refreshing mixed drinks, the bar serves a selection of delicious snacks.